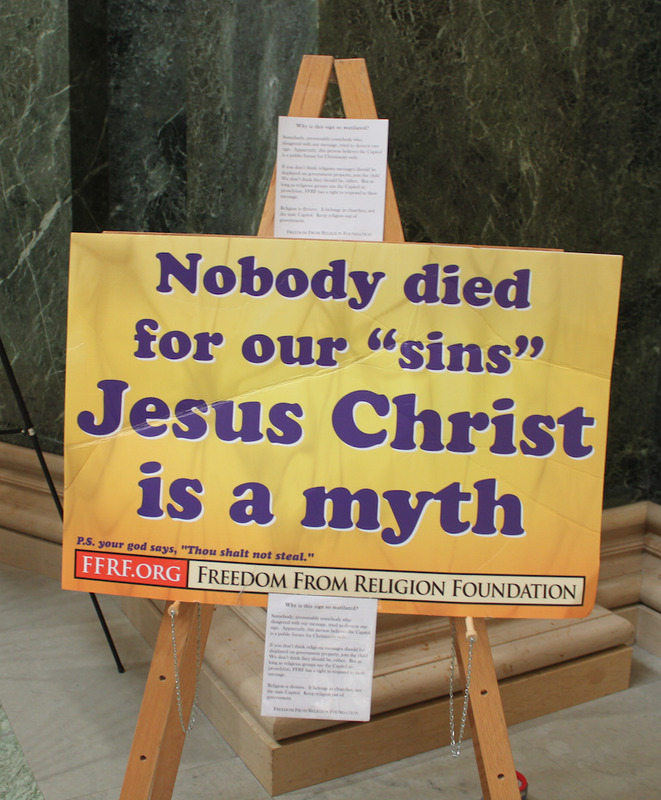 The Freedom From Religion Foundation is leaving on display — as evidence of the divisiveness of religion in government — its mutilated sign saying “Nobody died for our sins,” which was vandalized by a fanatic before noon today in the Wisconsin State Capitol in Madison. A man wrested FFRF’s foamboard sign, which was securely taped to an easel, and violently mangled it in front of passersby. Capitol security was quickly summoned and gave chase, but the vandal got away. Why is this sign so mutilated? Somebody, presumably somebody who disagreed with our message, tried to destroy our sign. Apparently, this person believes the Capitol is a public forum for Christianity only. If you don’t think religious messages should be displayed on government property, join the club! We don’t think they should be, either. But as long as religious groups use the Capitol to proselytize, FFRF has a right to respond to their message. Religion is divisive. It belongs in churches, not the State Capitol. Keep religion out of government. 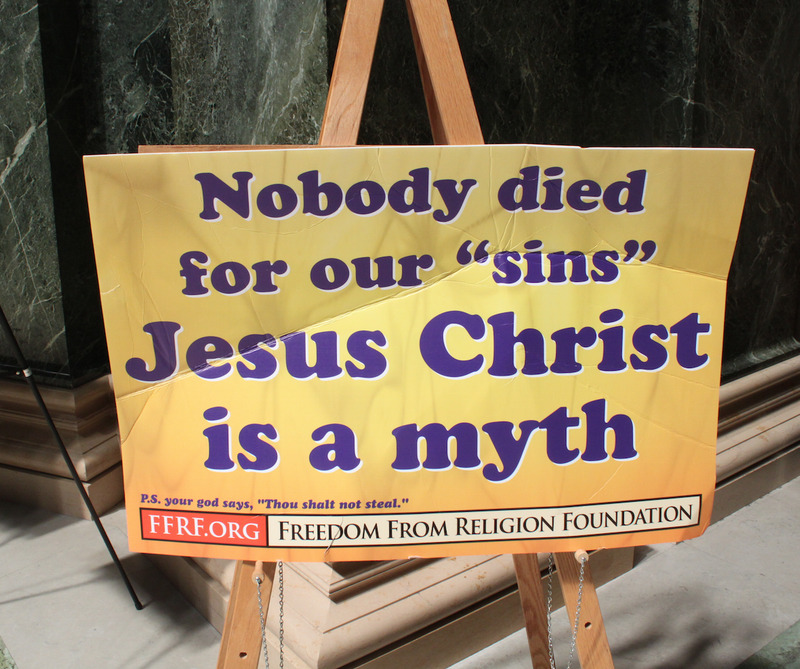 FFRF had sought and received a permit to display its message, "Nobody died for our sins. Jesus Christ is a myth,” in response to “Concerned Women for America’s” Easter display, which includes a cross on a table with religious and antiabortion literature and misinformation about birth control. FFRF has made an open records request for a copy of surveillance tapes. FRF thanks its staffers Jackie Douglas, Andrew Seidel, Patrick Elliott, Lauryn Seering and Dayna Long for help producing, displaying, and protecting its Capitol sign.